Home / DIY Home Decor / Furniture / DIY File Cabinet Makeover the Easy Way! 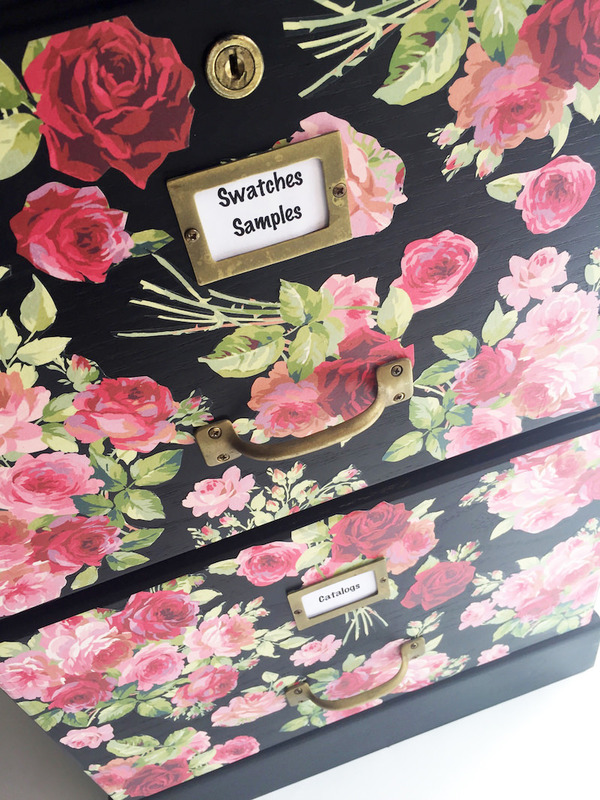 In this DIY file cabinet project, we'll show you the easy way to do a revamp with scrapbook paper! 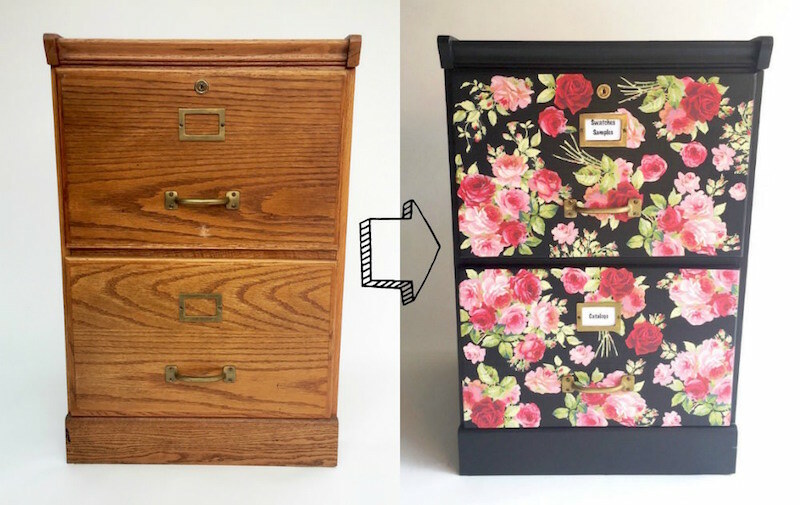 This filing cabinet makeover is SO cute. Skills Required: Intermediate. I would say this project fits on the low end of the intermediate category. It's easy to paint a cabinet (using my tips). BUT whether you're using larger sheets of paper or trying to piece together smaller sheets to cover the fronts of the drawers, you'll want experience. OR a lot of patience. Or both. It's really not *that* hard, but I want to make sure you don't get frustrated. Don't forget to scroll down to the bottom of the post to get a video of the process in action! How many of us have an old filing cabinet laying around? I know I do. I actually have one in my craft room right now that has been sitting there, ripe for a makeover. 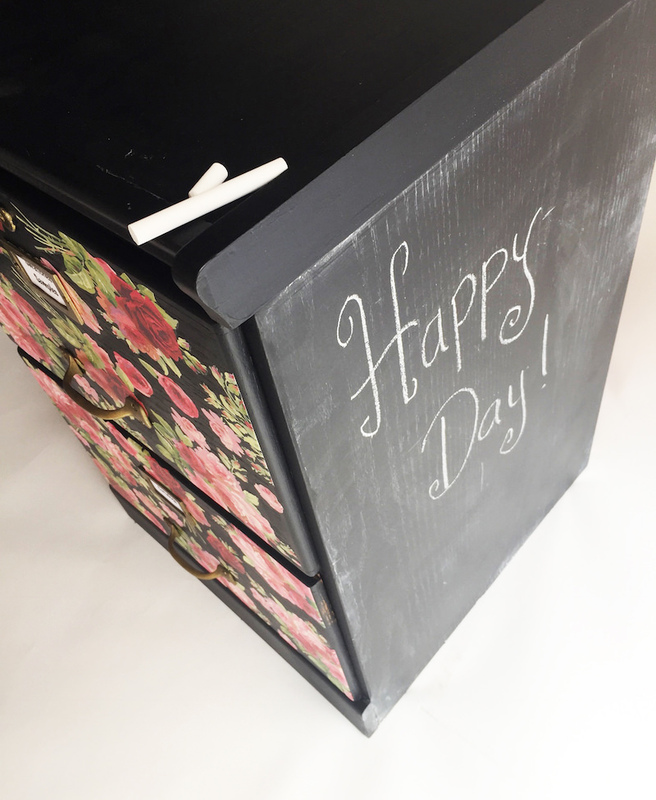 I'm excited to share my process for a DIY file cabinet today, and also share a cool wood file cabinet makeover from Cathie and Steve at the same time. By the end of this post, you're going to have the confidence you need to do your own makeover. It's not as hard as you think! If you want to read my tips, that section follows – otherwise just scroll down to the end to see the video of the DIY file cabinet in progress. I've got a ton of detailed instructions in my article “how to prepare furniture for Mod Podge” that should be helpful to you. Generally speaking you're going to want to remove all hardware, clean off any dirt, and then sand your piece to prepare it for Mod Podging. If your cabinet is wood, you don't necessarily need to prime it before you paint (if you choose to paint). Having said that, this project uses black chalk paint, which has great coverage. If you want to turn the cabinet a lighter shade, I would use a primer. There's no rule that says you have to paint your filing cabinet before Mod Podging it. Technically you could clean your metal or wood filing cabinet for your filing cabinet makeover, and then just add paper or fabric directly onto the surface using Podge. If it's my DIY file cabinet project, I'm probably going to paint in a complimentary color to the paper or fabric I'm using. I did that with my upcycled table as well as with my endtable makeover. That's just how I roll – I like color, so if I can bring it into a piece, I will. Metal – I always prime first with Rust-oleum Painter's Touch 2X primer. I have had nothing but positive experiences with this product, so I stick with what works for me. This primer forms a tight bond with the metal and works on metal, wood, and plastic. After I prime with the Rust-oleum, I let that dry and then spray paint the metal with the color of my choice. Then I let that dry and Mod Podge my fabric or paper on top. 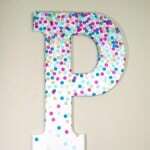 You can absolutely Mod Podge on top of spray paint – I've done it many times. 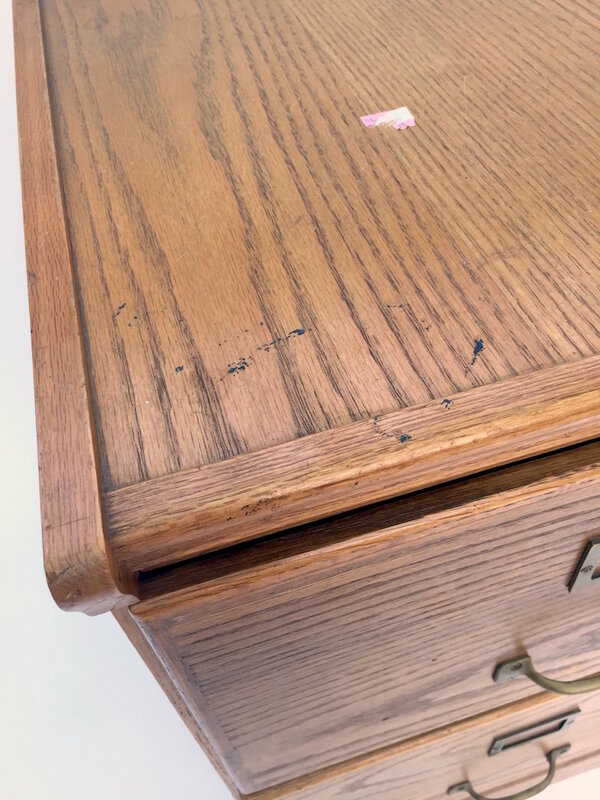 Wood – I feel like I have a lot more options with wood filing cabinets in terms of paint, since wood is porous and accepts paint a lot better without scratching off. As I said before, if I'm going with a lighter shade than the cabinet, I'll prime. I have used chalk paint, acrylic craft paint, and chalkboard paint pretty regularly on wood surfaces and they all work great. 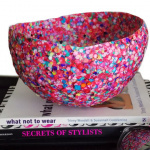 The key is that you are looking for an acrylic paint versus a latex paint. Latex paint doesn't work well with Mod Podge. In this project, Cathie and Steve use the Mod Podge Furniture formula. It comes in three finishes – Satin, Gloss, and Matte. Mod Podge Furniture has been discontinued by Plaid (the manufacturer), though it's still available in some stores until it sells out. If you can't find it, use Mod Podge Hard Coat with the purple label. It's the same thing. You have a few options for applying paper in your DIY file cabinet project. Let's review them below. Scraps/Cutouts – In the video you'll see that Cathie and Steve use cutouts from the scrapbook paper to Mod Podge. This is the easiest method to avoid wrinkles, and you have a lot more control over your design. Piecing Together – Another method is to take scrapbook paper sheets and then piece them together on the fronts of the drawers. The trick here is making sure that you have sheets with a design that continues from one page to another, or you're going to see the paper seams. One Large Sheet – If you're going to use one large sheet on the front of the drawer, you're probably going to end up using wrapping paper or something a little more thin (since that's what typically comes in sheets). In that case, you'll want to mist the paper like I did for my DIY coat rack. This helps it go on easier, without wrinkles. Are you ready to dive into the project? Let's go! 1. Remove hardware and set aside. Clean your file cabinet; sand and remove any dust. Fill any holes. 2. Prime your cabinet with paint following the tips outlined in the painting section above. Let dry. 3. Trim your paper to fit the fronts of the drawers. Mod Podge the paper to the drawers and let dry. Give your cabinet several coats of Mod Podge to seal and protect. 4. Add any additional paint or embellishments that you'd like – for example, chalkboard paint on the sides, ribbon, buttons, glitter, etc. 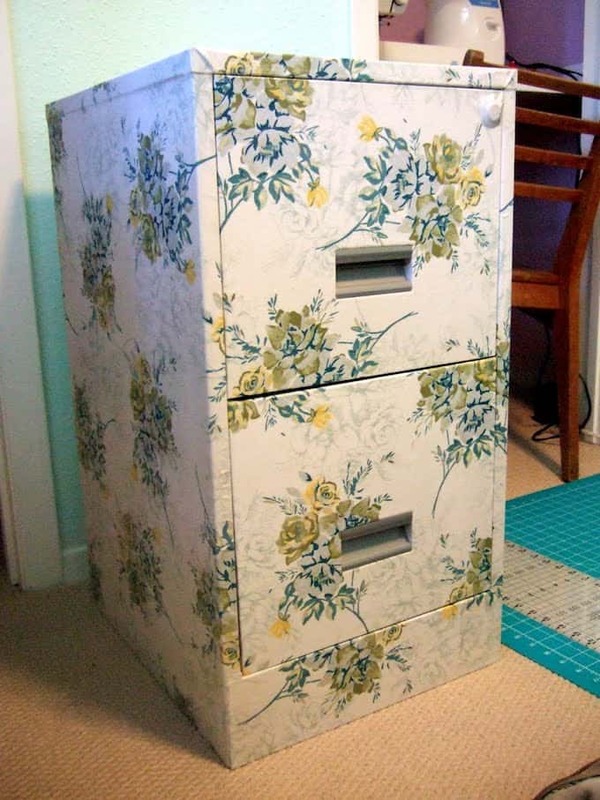 Oh, and just for fun, here's a metal filing cabinet makeover. See? 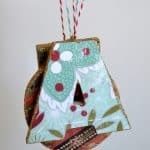 The possibilities with Mod Podge are endless! 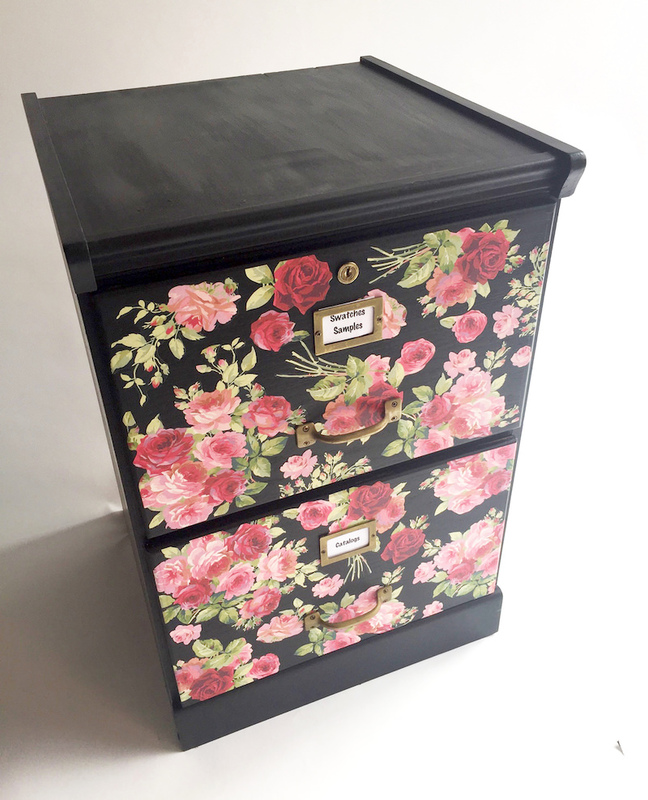 I saw a how-to for a file cabinet update that included spray paint and stencils. It was really cute, but something about spray paint scares me (I’m a messy crafter and I can imagine it ending up all over my things and my body…) but your idea is an equally adorable alternative. Thanks! Hi Amy, lovely transformation. Your cabinet looks great! Thank you for sharing.